Yes, it's true! 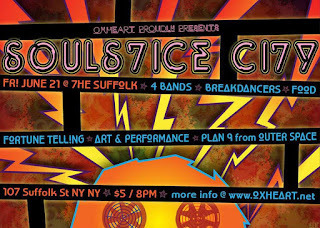 Another OXHEART show is upon us: SOuLSTICE CITY, this Friday, June 21 at The Suffolk Bar on the Lower East Side (tucked inside the Clemente Soto Velez Educational Center at 107 Suffolk Street b/t Delancey and Rivington)! 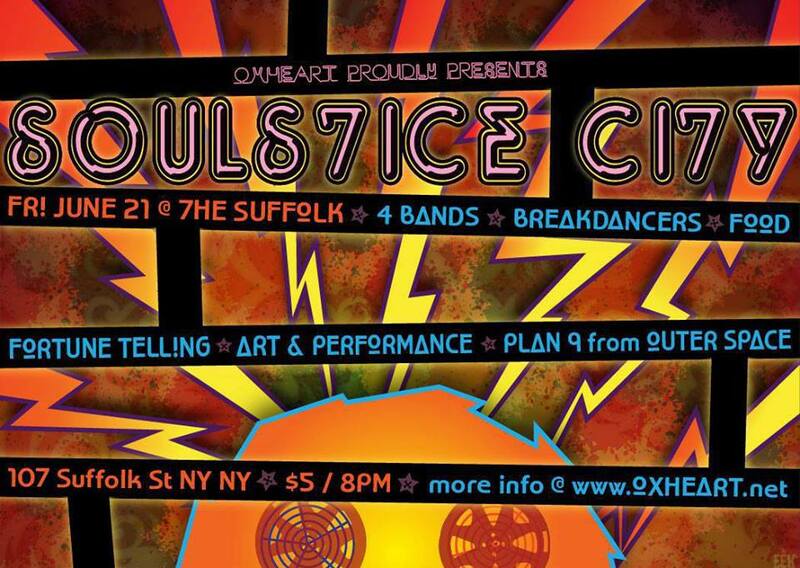 * It's only $5 (21+)and we're psyched to welcome some superfunky bands, as well as performance and visual artists. We're also beyond excited to welcome the Reacheadz breakdance crew, who will be performing throughout the night. Check out an interview with crew member Ben Kassoy to learn more about them, and take a look at pictures from a rehearsal featuring crew members and friends! How and when did Reacheadz start? So the name Reacheadz comes from Project Reach, the community center in Chinatown where we practice. I'm not sure how long guys have been practicing there, but we formed a crew about a year ago. How did you begin breaking? I've danced all my life, mostly because my sister did. I took ballet, tap, and jazz growing up and then discovered breaking in college. How do you keep your moves fresh? I wish I could keep them fresher. Compared to most of the Reacheadz, I'm over the hill. I'm like an old man on the decline, compared to these young up-and-comers. I try to gain inspiration wherever I can, and I love watching different styles. One the beauties of breaking is that it's a fusion of styles and disciplines--martial arts, capoiera, Charleston, tap, jazz, gymnastics, etc.--and that it continues to encourage outside influences. I love watching kids do get lite on the subway or contemporary ballet in a theater or house in a club; all of it informs and inspires my moves. How many members are there? What is the age range and/or what do you all do when you're not breaking? There's no "official membership," but there are probably 10-12 of us. Most of the guys are in late high school or early college. Two of us are in our mid-20s and Eric, who I call our sensei, is in his 30s. What are some tips you can offer to someone interested in learning how to break? First, you can come out to practice with us. But understand that breaking started in the streets, so learning and practicing are much more informal than other dance styles. It's difficult to find classes, and even though the dance is more mainstream now, most people are self-taught. Watch a lot of videos and tutorials, listen to the music, practice on your own, then find a practice spot where you can learn moves and gain inspiration in an environment where you feel comfortable. What are the most exciting and most challenging parts of breaking? Sometimes the greatest challenges are more mental than physical. It's easy to see other people improving or mastering moves you want or performing a better version of your style and get discouraged. It's easy to have short spurts of improvement followed by long plateaus. It's hard and it's frustrating. The most exciting part is overcoming those hurdles mentally and physically, of feeling your body transcend a previous version of itself. It's exhilarating and keeps you focused. What is a typical rehearsal like? We don't really call it "rehearsal," because it's not that formal and we're generally not "rehearsing" for anything in particular. Instead, it's just a "practice" or a "session." It's laid back: we put on some music and generally have a few "cyphers," that is, where one person freestyles in the middle of the circle at one time. Sometimes we'll play games with freezes or footwork, and other times we'll battle each other. People come and go as they please; we work hard but laugh a lot, too. Where do you break when you're not at practice? New York City is the birthplace of breaking, so it hosts lots of "jams," that is, big public events with a DJ, cyphers, and battles. Sometimes we break in public places, like Union Square. I never go with the intention of doing this, but sometimes I cypher in clubs or find myself called out for a battle. It doesn't matter how drunk or unprepared you are: if someone calls you out, you have to smoke them. What can OXHEART-goers expect from a Reacheadz performance? Honestly, WE don't even really know what to expect, because we're just freestyling. The energy and the flow of our performance is really organic and can change based on a lot of things. It's definitely going to be raw, though: as in, everyone's style is really unique, so you're bound to see an eclectic mix of styles. Unlike some crews, our attitude is less confrontational and more creative. I don't want to hype us too hard, but the goal here is to inspire and amaze.